President Duterte visits Jolo today in the wake of Sunday’s double bomb attack on the city’s cathedral. President Duterte has said a husband and wife team of suicide bombers were behind the twin bombing at Jolo Cathedral on Sunday. His words today (Tuesday, January 29) come after Islamic State claimed responsibility for the attack, which left 21 dead and dozens injured. The president has also vowed to crush the IS-affiliated terror group Abu Sayyaf, which is believed to be directly responsible for the attack. Speaking to reporters in Jolo today, the president said he had received the information about the attackers from the intelligence community. He then described how the woman entered the church and blew herself up in the middle of the 8am Sunday Mass. Because she was female and wearing a large cross, the president said, she did not arouse any suspicions. Meanwhile, her supposed husband waited outside the church and detonated his device when security personnel rushed to the site of the first bomb. He also said he had “no doubt” that the attack was carried out by Abu Sayyaf. He also floated a plan of concentrating all civilians in a single place where the government would provide for their needs, so the military would be free to bomb terrorist hideouts. “I’ll take all the innocent people. You come here, I’ll feed them. I’ll make sacrifices. I’ll look for the money. Then crush their territory,” he said. 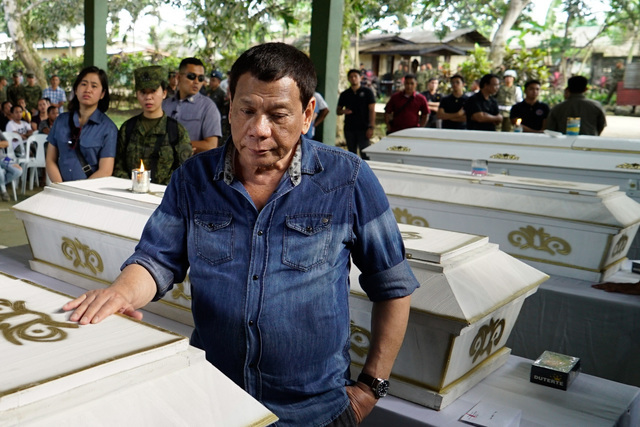 The president spent about three hours in Jolo, where he inspected the bomb site, visited the wake of blast victims, and spoke with injured civilians, soldiers and police.